前幾天在 RWW 上有一篇文章, 介紹了可以幫助 Bookmark Favorite Images 的三個 Sites : 3 Cool Sites to Bookmark Your Favorite Images on the Web. 昨天在看到一篇與 Cloud Computing 相關的文章, 並把他利用回應的方式附加到我之前的文章時, 忽然想到, 往往我們在 Web 上會看到跟之前一些想法相關的資料, 包含文章圖片影像動畫等等 -- 姑且稱為 Web Materials 好了 -- 是否可以有很容易的方法來蒐集組織他們呢 ? 之前用過 Google Notebook, 在蒐集上是很方便, 但是後端的組織就比較弱. 這種類似的系統由於缺乏比較系統化的組織工具, 因此容易出現蒐集了一堆, 後續處理反而麻煩的情況. 利用 "Bookmark MindMap" 在 Google 做了一下搜尋, 發現有一些類似的 Tools, 例如有人替 Del.icio.us 作了 Delicious Mind Map Maker, 可以吃進你的 Del.icio.us 資料, 製作出 MindMap 來. 不過這些都跟我想要的還是有一段距離. 我認為一張 MindMap 應該是以一篇 Post 為中心, 而往外擴展關係, 然而整個網站未必要是多張獨立的 MindMap, 這樣會讓 Blogger 整理到死. 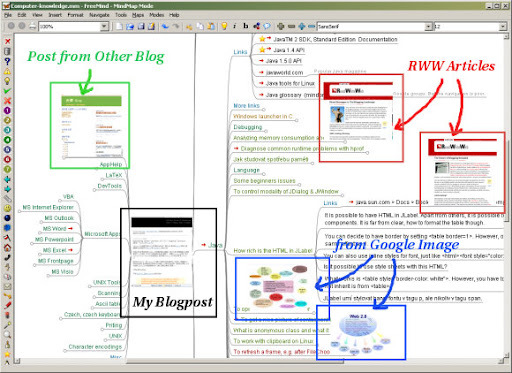 相對的, 一個 Blog 本身是 Personal Knowledge Web, 而以單一 Post 為中心可以得到一個以上的 MindMaps. 這也跟之前 Library 2.0 的討論有相關之處. This entry was posted on 上午7:37 and is filed under data and knowledge engineering , idea , web engineering . You can follow any responses to this entry through the RSS 2.0 feed. You can leave a response, or trackback from your own site. 同時要求的資訊整合跟個人表達能力要更高於現有的 presentation software -- 同一份整理用不同的順序講以及選擇性的講解內容, 效果可能大不相同.